Music is an amazing thing. It brings vibrancy to our world, it comforts us when we are down, it motivates us, and it can help stimulate our brains. Exposing music to your little one is a great thing you should consider. Not only will your child enjoy it but it will also be something that can help them for their entire lives. Music does a wide range of exciting things to your mind, especially the brain of a child. It encourages growth in many areas of the brain. This stimulation will help your child excel in many aspects of their lives. Children, who listen to music or even learn how to play it, typically do better in school, are better problem solvers, and have an easier understanding various academic subjects and topics. Music can be very fun for a little one. It provides them with an excuse to dance around, sing, or play while stimulating their brains at the same time. Learning how to play music can also be very exciting and can provide even greater benefits than simply listening to it. There are many different kinds of instruments your little one can try, so there is something bound to interest them. Music can help improve the cognitive development of your little one in many ways. One of the varieties of ways music can help your little ones improve their memory. This will make it easier for your little ones to do well in school and in many aspects of their day-to-day lives. This is one of the many reasons why music is such an important part of preschool and child care in Bronx, New York. Those are just a few of the many different benefits of exposing your little one to music. If you would like to find out more about these benefits or if you are interested in learning more about our day care center in New York, please feel free to get in touch with us at Tender Years Childcare for more information. 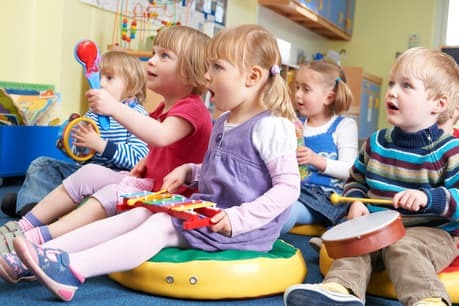 This entry was posted in Music and tagged Child Education, Child’s Development, Day Care. Bookmark the permalink.